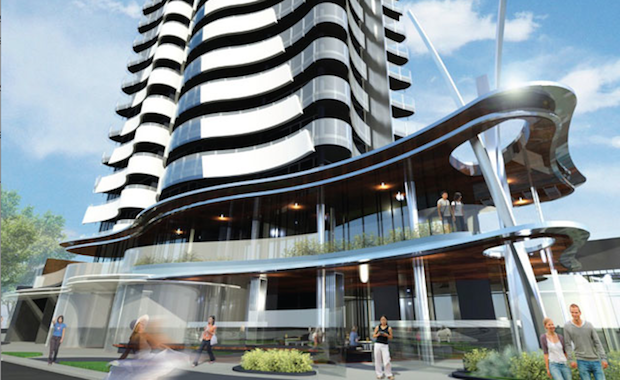 The southern Gold Coast apartment market is about to get a boost with the limited release of luxury apartments in the $85 million Sanbano residential tower. The Chinese-backed Marine Parade Holdings Pty Ltd is set to release to the 10 fully furnished, whole floor apartments. The Sanbano apartments, at the corner of Marine Parade and Dutton Street in Coolangatta, are priced in excess of $2.7 million each. In its latest apartment survey, research group Urbis found there were only 47 new apartments across six projects for sale in the southern Gold Coast and Tweed precinct. The survey included both mid and high rise buildings. Urbis Senior Consultant Lynda Campbell said there had been 22 sales in excess of $1 million during 2013 and now stock levels were extremely low. “The Sanbano release will be welcomed by the market because there really isn’t much to choose from at the moment, particularly at the upper end,” she said. “Our new report, Gold Coast Apartments Insights, revealed that strong population growth would continue, driven by planned and current infrastructure spending of around $13.7 billion on the Gold Coast and northern NSW and future projects coming online would help fan that demand, Ms Campbell said. CBRE Residential Project Director Chris Litfin, who has been appointed by Marine Parade Holdings to market the 10 apartments in Sanbano said initial interest had been very strong. “The southern Gold Coast is undergoing a renaissance and now we are seeing a lot of people turning right instead of left when they come out of Gold Coast Airport at Coolangatta, but we have not had a lot of options to show people,” he said. “The natural attractions of this part of the Coast and a gentrification of the area with things like the recent Opera on The Beach, the Coolie Rocks On festival, a $65 million expansion and upgrade of the existing Showcase on the Beach retail centre and a realisation that the lifestyle available on the southern Gold Coast is unequalled has seen the spotlight refocused here,” he said. “The developer has the financial strength to have not needed any pre-sales and he made a commitment to the Mayor of the City, Tom Tate, to create something very special in Coolangatta and he has. The whole floor Sanbano apartments are 318 square metres and come with two side by side car spaces. They have three bedrooms, master overlooking the beach with a balcony including a spa, and two bedrooms are ensuited. Living rooms have natural stone flooring, elegant furnishings with individually selected pieces and floor to ceiling glass to maximize the views in all directions. The living rooms also feature a generous balcony overlooking the ocean. “Sanbano will be the first of what I predict will be a number of new high end residential projects that will appear at that end of the Coast as it continues to be rediscovered", Mr Litfin said.